AMC has released a special behind the scenes look at the first season of its new miniseries, The Little Drummer Girl, which is set against the backdrop of conflict between Israel and Palestine. The show’s creators explain the complexities behind their characters, and how they brought the project to life. You can take a look at the featurette in the post below! 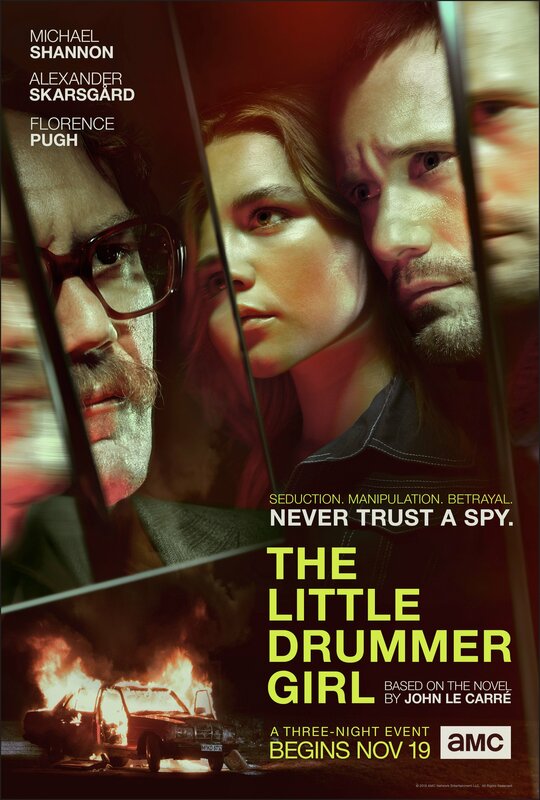 The Little Drummer Girl weaves an explosive story of espionage and international intrigue; of love and betrayal. Brilliant young actress Charlie (Florence Pugh) strikes up an acquaintance with an intriguing stranger while on vacation in Greece, but it rapidly becomes apparent that his intentions are far from romantic. The man is Becker (Alexander Skarsgård), an Israeli intelligence officer, who entangles her in a complex and high stakes plot orchestrated by Spymaster, Kurtz (Michael Shannon). Set in the late 1970s, yet sharply contemporary, the global thriller is from the executive producers of the Golden Globe and Emmy Award-winning series The Night Manager and marks the television directorial debut of visionary filmmaker Park Chan-wook (Oldboy, The Handmaiden, Stoker). The miniseries is co-produced by the BBC, AMC and The Ink Factory, in partnership with 127 Wall. Simon and Stephen Cornwell serve as executive producers, along with John le Carré, Mona Qureshi for the BBC. Also Joe Tsai and Arthur Wang will executive produce for 127 Wall, Wonjo Jeong, and Park Chan-wook. AMC has give international distribution rights to Endeavor Content. The anticipated series is slated to debut in the U.S. on AMC as a must-watch, three-night television event with a two-hour episode on November 19 at 9:00 P.M. ET/PT. Additional two-hour episodes will air on consecutive nights at 9:00 P.M. ET/PT on November 20 and November 21. The post Go Behind the Scenes of The Little Drummer Girl Season 1 appeared first on ComingSoon.net.